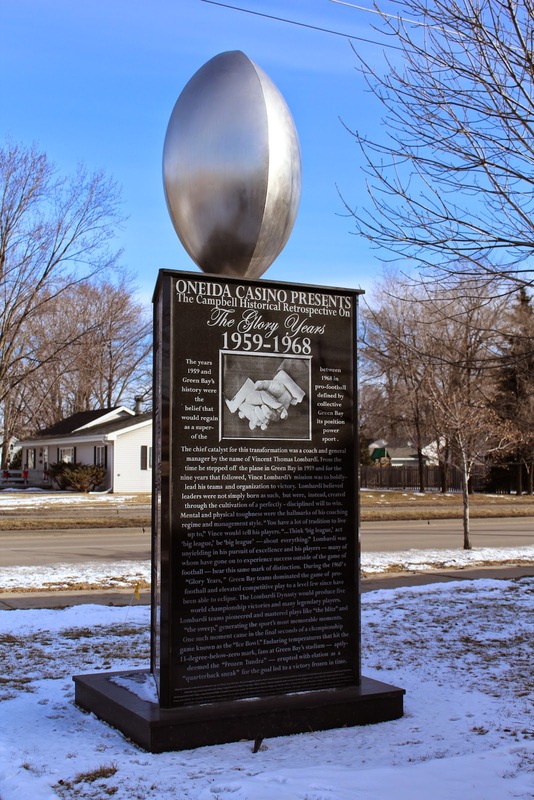 The years between 1959 and 1968 in Green Bay's pre-football history were defined by the collective belief that Green Bay would regain its position in as a super-power of the sport. The chief catalyst for this transformation was a coach and general manager by the name of Vincent Thomas Lombardi. From the time he stepped off the plane in Green Bay in 1959 and for the nine years that followed, Vince Lombardi's mission was to boldly lead his teams and organizations to victory. Lombardi believed leaders were not simply born as such, but were, instead, created through the cultivation of a perfectly-disciplined will to win. Mental and physical toughness were the hallmarks of his coaching regime and management style. "You have a lot of tradition to live up to, " Vince would tell his players. "...Think 'big league.' act 'big league' be 'big league' -- about everything." Lombardi was unyielding in his pursuit of excellence and his players -- many of whom have gone on to experience success outside of the game of football -- bear this same mark of distinction. During the 1960's "Glory Years." Green Bay teams dominated the game of pro-football and elevated competitive play to a level few since have been able to eclipse. The Lombardi Dynasty would produce five world championship victories and many legendary players. Lombardi teams pioneered and mastered plays like "the blitz" and "the sweep", generating the sport's most memorable moments. One such moment came in the final seconds of a championship game known as the "Ice Bowl." Enduring temperatures that hit the 13-degree-below-zero mark, fans at Green Bay's stadium -- aptly-deemed the "Frozen Tundra" -- erupted with elation as a "quarterback sneak" for the goal led to a victory frozen in time. 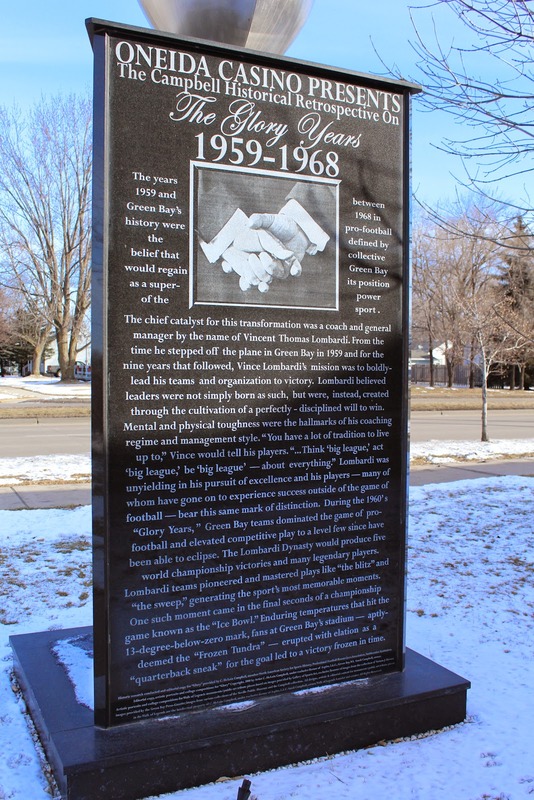 The monument is adjacent to a parking lot next to Marty's Boston Crab on eastbound Lombardi Avenue, east of its intersection with Bart Starr Road, at 875 Lombardi Avenue, Green Bay, Wisconsin 54304. NOTE: Marty's Boston Crab has gone out of business; the building appeared vacant at the time of my visit. that's Dickey's Barbecue Pit in the background.